Happy Thanksgiving Everyone! I hope everyone is having a fabulous day – sharing love and food with family and friends! 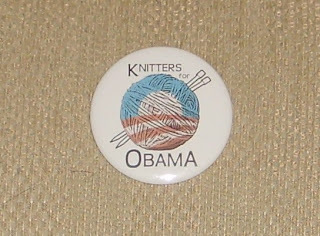 Once the turkey is in the oven, it’s the perfect time to slip in some quality knitting/spinning time! I’ve been spinning this morning – the first time in several weeks! This past week has been a great week for knitting progress as well. 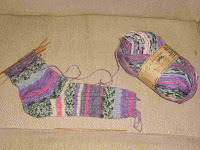 I managed to knit on the Metro on both Monday and Tuesday, so I’ve made quite a bit of progress on the Opal socks. There will be no "second sock syndrome" here! The Metro was extremely crowded yesterday afternoon, so I didn’t get to knit on the way home...everyone that went to work yesterday was leaving early! I even managed to get together with friends to knit on both Sunday and Tuesday! Wow - two outings in a single week - that's almost unheard of for me! Janet modeled her shawl – it’s even more gorgeous now than before blocking! 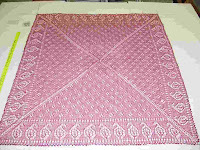 The pattern is the “Paisley Scarf” from Interweave Knits Spring 2005. Definitely a “must” in my list of projects! She did make a modification to the pattern that added a very nice finish. She added a picot edge on the cast off. 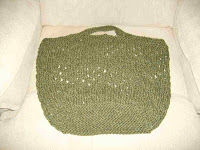 I finished the "Fantasy Naturale Market Bag" – it’s a very quick knit on size 15 needles. I started it this past Sunday, made a lot of progress on it when met with some friends on Tuesday, and put the finishing touches on it last night! It only takes 2 skeins of the Fantasy Naturale yarn from Plymouth. I have two more skeins to knit up – this time, in a burgundy red. I think I may have to run out and pick up some more of this yarn – it’s a very fun project and the pattern is free on the Plymouth website! Oh....and after indulging in all the turkey, stuffing, and sweets, I'm planning to end my Thanksgiving with even more knitting and spinning! 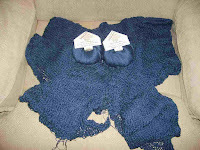 Perhaps I might even start on the "Genevieve Shawl"! Oh-la-la! The Genevieve Shawl kit has arrived! I placed the order only 6 days ago - talk about fast! It shipped from France and arrived today! Wahoo! The colors are absolutely fabulous! The depth and tone are just gorgeous! It's even more beautiful than I'd anticipated...I can't wait to start on it! If you're thinking about ordering the Genevieve Shawl kit....or perhaps some naturally dyed yarns, then Renaissance Dyeing is a MUST - super fast shipping, great customer service, and a fabulous product! The variety of yarns and colors is just amazing! What more could you ask for? Quite a spread of topics, eh? Well, this has been a very interesting weekend - full of many interesting things. I'll start with the Sons of Norway Lodge meeting on Friday. 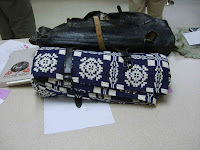 Our program this month was about the Scandinavian Regiment that fought in the Civil War. 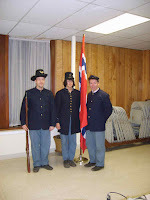 A group of 3 Civil War re-enactors provided a lot of background and information on the Scandinavian impact on the civil war while modeling their uniforms. More information about the 15th Wisconsin Regiment (aka the Scandinavian Regiment)can be found here. One of the guys added some "special touches" to his gear to in order to identify himself as Norwegian. 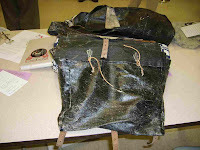 Here, you can see the replacement clasps on the satchel - instead of the standard buckle, he put Nordic sweater clasps on it when the original buckles were damaged/lost. The blanket the he used was a woven Norwegian cotton blanket instead of a wool blanket - something a bit cheery to remind him of the "home". One other "customization" was the addition of Norwegian embroidery to his suspenders. My friend Janet finished a fabulous shawl - isn't it beautiful? I love the swirls in the edging. Hmmm....dummy me doesn't remember the pattern. I need to check with her on that and then I'll update this post. Today, a group of us got together to knit and have brunch - and of course, I started a new project. 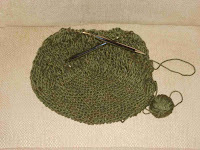 I started knitting a "green" shopping bag out of Fantasy Naturale yarn from Plymouth - in green, of course! It's a cable twist mercerized cotton yarn. No picture yet...sorry. The pattern is a freebie from their website called - free Fantasy Naturale Market Bag. It's quite easy and will be a quick knit. Finally, the "Angels" part of my post. 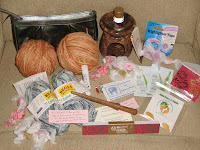 I received a fabulous package from my "Angel" - the lovely person that stepped in when my swap partner for the Ravelry POS and PINS swap in the Monthly Adventures group apparently dropped out and didn't send the anticipated pin. The package my angel sent was absolutely fantastic! She definitely went "above and beyond!" 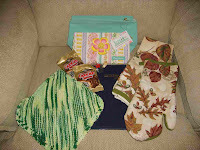 In addition to two pins (an angel and a smiling star), there were a pair of Debbie Macomber zippered bags for my knitting gear, 2 GooGoo Bars (chocolate, pecans, caramel and marshmellow - mmmm! ), a monthly planner, a hand knit dish cloth, and a dish-towel and oven mitt in a "Fall Leaf" design - just in time to use for Thanksgiving! Many, many thanks to my wonderful "Angel". You've definitely earned your wings! 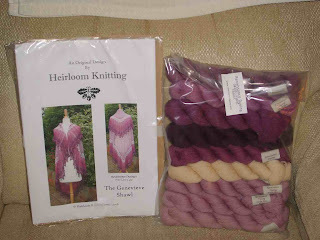 OK...I gave in and ordered the wonderful shawl kit that Catherine showed me. Yes, it's the shawl I alluded to in my previous post. I think it's gorgeous! The really cool part is that the yarns are all dyed with natural dye - how cool is that? 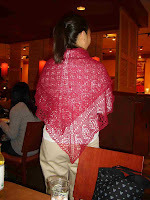 You can check it out here: Genevieve Shawl Kit. I should have it in 2-10 days.....I can't wait! PS - Just in case you REALLY like the shawl, but don't care for purple, she allows you to choose your colors if you wish so you can customize it to your preferences! There's been quite a bit of knitting being done around here, although I managed to "avoid" the finishing on the Maggi Knits top! Hmmm...imagine that. Me avoiding the piecing together of projects and opting for knitting instead! 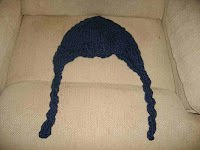 I finished the Nordic style hat for my former Program Manager out of Aslan Trends Del Sur. 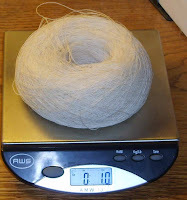 It used exactly ONE ball of the yarn with very little left over. I'm not real keen on this sort of hat, mainly because of how I look in them. However, he selected the style based on the hat his Brazilian friend had. The sole purpose of this hat is to keep his head warm on the train platform. I just need to wash and block it and then it's ready for delivery. Late last week as well as today, I managed to get in some quality knitting time on my Opal socks while riding the Metro. One of the passengers (a young 20 something) was totally intrigued by the process of knitting - especially the process of knitting a sock. We had a very nice chat...and hopefully, we have a new knitting convert! 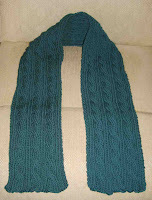 Saturday, I finished my "Irish Hiking" scarf - I LOVE it! The color, the drape of the scarf and its overall weight are perfect! There's a lot of spinning oil in the wool, so I definitely need to give it a good washing. The yarn I used, Merino Otto, had only 90 some yards per skein, so I had to use 4 skeins for the scarf so there are lots of "woven in ends" that I need to "set". I also have made great progress on a scarf for my Ravelry swap partner. It's about 1/2 done now. It's in Malabrigo worsted weight yarn in a caramel/butterscotch color way. It's absolutely scrumptious to knit with. Sorry...I can't show a picture yet as the scarf pattern needs to be a surprise to my swap partner. I'll definitely post a photo later...once the scarf is complete and has been received by my partner. I ended the weekend at Catherine's with a few other friends - knitting and "enabling" each other. That's where I finished the Nordic hat and got a "tip" about a lovely shawl that I just "have to make" - it's gorgeous and is in all naturally dyed colors. And...the colors just happen to be colors I love - LOL! Oh...an added bonus to the day was the luscious Jamieson and Smith Shetland lace yarn that Catherine gave me. There's a solid ounce of this very fine yarn. I just need to figure out the yardage....and then find a suitably lacy project for it. Any suggestions? Wahoo! Happy-happy joy-joy! I shuffled around and organized some of my roving - long overdue I might add. Guess what I found nestled in with the corriedale, mohair, and merino? You guessed it....that elusive skein of deep teal Merino Otto! Now I can finally finish my Irish Hiking scarf...just in time for winter! 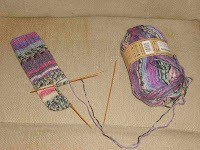 I've also made some additional progress on my Opal socks. I've turned the heel and am working on the heel gusset. 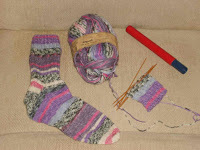 Hopefully, I'll get past the gusset by the end of the day today and I'll be able to work on the foot of the sock while riding Metro. I've also made great progress on my first "Maggi". I'm making the off-the-shoulder denim blouse from the "Nautical Look" book. It reminds me a bit of a peasant blouse from back in the 60's and 70's. I started it on Oct. 24 and by last Saturday (Nov. 8), I'd completed the 4 main parts - front, back, and both sleeves. On Sunday, while visiting Mema, I started working on the I-cord for the ties - at the neck edge and the bottom of each sleeve. I only have a few more inches to go on the I-cord for the neck and then comes the dreaded finishing. Ugh. I really had piecing things together and sewing them up by hand! I am definitely anxious to complete this project, so I doubt this project won't languish in the "to-do" pile. I'll leave you with a few fall views....the last of the colorful leaves. In the past couple of days, nearly all the trees have dumped their "beauty" and are no looking sad and grey...ready for the long winter. 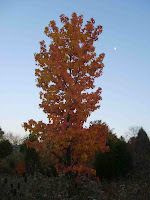 The tall tree had such a nice variety of red, yellow, and orange leaves with just a hint of green. This photo doesn't quite capture the vibrancy of the colors, but you get a "hint" of it's beauty. 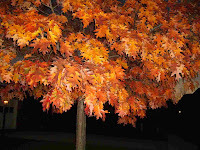 Unfortunately, it was a bit too dark when I tried to photograph the oak, so I had to get in a bit close to capture the colors. 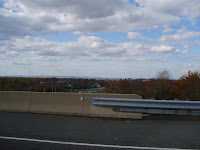 Finally, if you double click on the third photo, you can see the lovely mountains in the background. I thought the clouds were pretty awesome as well. I'm totally enamored with the mountains...they're both majestic and soothing. I don't think I could live anywhere that wasn't close to the mountains. On this historic day, I am VERY proud to be an American and VERY proud of my country! We've come a long way! In the "Monthly Adventures" Ravelry group, we do an exchange of some sort every month. This month, it was the "Magic Ball" exchange. I had to select goodies for my exchange partner that included stuff from the state where I reside...yarns, snacks, trinkets, etc. 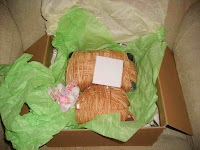 Then we were to select a yarn that we really like and wrap it around all the goodies, "hiding" them within the yarn ball. When our partner receives our "Magic Ball", she is to unwind it to reveal all her goodies. The next step is to take the yarn that she unwound and knit a scarf for me from a pattern of their choice. How cool is that? I sent my partner Blue Heron Yarn in the Antique Copper colorway out of beaded wool. The goodies I received (above) are fabulous! I love it all - especially the Soapstone oil burner with the cranberry scent. Mmmmm.....it smells delicious! The yarn is a cotton wool blend - it will make the perfect pair of socks to go with jeans! The yarn she wants a scarf made out of is a varigated gold Malabrigo....it's soooo soft! I'm definitely going to enjoy knitting her scarf out of this! 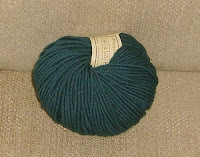 (Worsted weight yarn with a total of 432 yards, so I'll have LOTS of options!) Now, if I can just find the right pattern......any suggestions?